ToughTested is a company that specializes in designing tech gear for outdoor usage. To live up to the name of ToughTested, it must pass rigorous testing meant to put the devices under extensive stress. Their products are designed with heavier duty cords, higher amperage, longer battery life and more durable materials. ToughTested offers a range of products for mobile usage designed to power your device, protect the device and to hear the device all in outdoor environments. 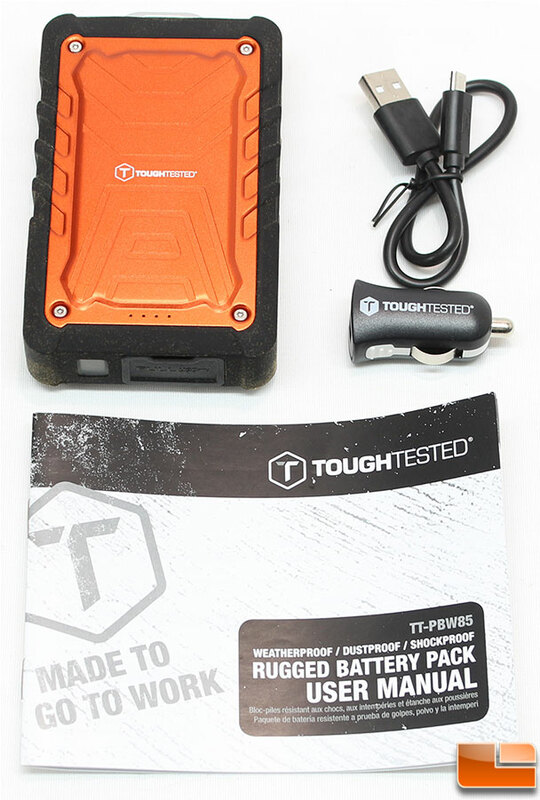 Today, we will be taking a look at the ToughTested Rugged Battery Pack. 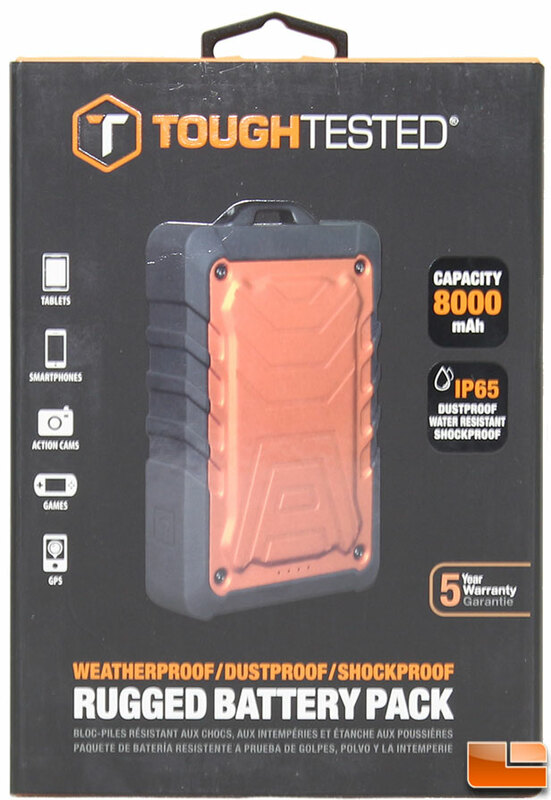 ToughTested has only one model of the Rugged Battery Pack, which is the 8000mAh version sold under part number TT-PBW85. It has a retail price of $79.99, but can easily be found line for $44.99 plus shipping, which includes a 5-year warranty! This should show you the confidence that ToughTested has in the ruggedness of their battery pack. With one of the longest warranties on a battery pack that is meant to be dropped, and abused that should show you that they mean business. Keeping in mind that the warranty won’t cover any intentional abuse or damage. Packaging for the ToughTested Rugged Battery Pack is pretty simple, but yet provides more than enough information for the average person to know exactly what they are looking at. Externally, the front provides you a quick view of the battery, while the back of the box goes into more detail. The battery itself is packaged in a plastic tray that has been flocked. This gives it a nice high quality feel, but also makes a little mess on the battery; which we will see in the pictures below. The ToughTested Rugged Battery Pack includes very few items. In addition to the battery pack, there is a short 1ft micro-USB cable, and a single port car charger that provides 1A output. There is also a multi-language user manual, that covers everything you need to know about the battery pack. A wall AC adapter is missing from the accessories, most of us have several laying around the house by now, however it would be nice to have one included just in case.